The Indian Chinese is our favourite go-to when the body craves for some salty, err, tasty treats. When we pass by the Chinees stalls on the road and the China Garden hotel (I am sure every city has several by the same name), the aroma makes me want to linger. And stare at the man behind the stall making his manchurian swirl in his wok or tossing the fried rice up in the air, to expertly catch it at the right moment as it lands back in his wok. And those red dragons painted on the stalls. Oh, I want to go to one right now. Never mind. 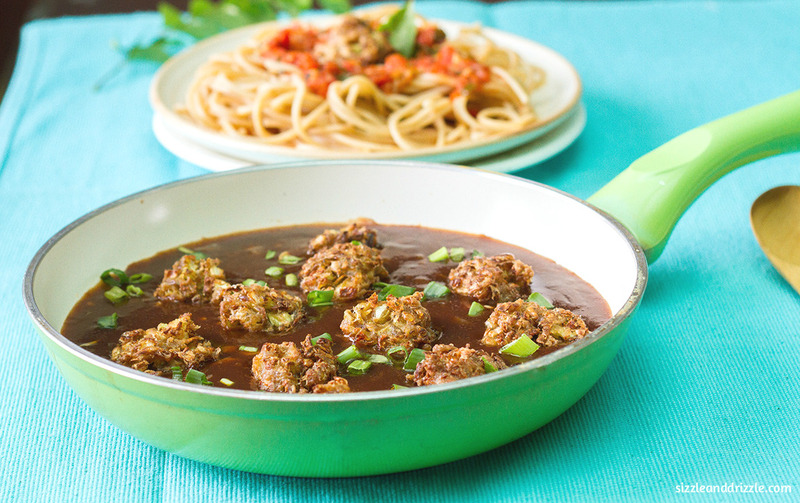 We love to make the Vegetable Manchurian in the thick garlicky gravy at home. It is without the drama of the banian-clad man on a chinese stall, but tastes excellent. I also add a pinch of ajinomoto in the dough and gravy, we love that umami taste. But you can totally skip it. My husband believes it is safe and naturally occurring in many a foodstuff like mushrooms etc., and I take his word on that. Generally veg manchurian goes well with any rice or noodles. Last Sunday we ate it with some boiled pasta, sautéed in butter and some herbed red sauce. It was a good lunch! Spring onion greens for decoration. Keep all the vegetables washed and chopped, ready to use in a large bowl. To it add all the ingredients as mentioned in Manchurian balls, except the water. Knead it all together to form balls. I needed about 1 tablespoon of water. It should be a sticky dough which can be roughly rolled into balls. 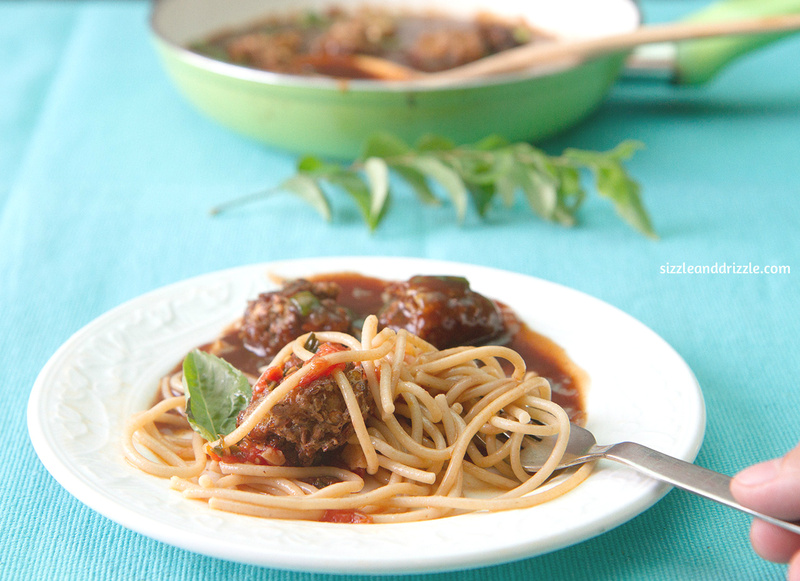 In a large kadhai, heat some oil and fry these Manchurian balls on low heat. Drain on kitchen paper and let them cool. To make the gravy, in a thick bottomed vessel, heat some oil. Fry the garlic and add the onions. Cook till translucent. Then add rest of the ingredients mentioned in the gravy and let it simmer on low heat for 5-7 minutes. The sauce will begun to thicken. 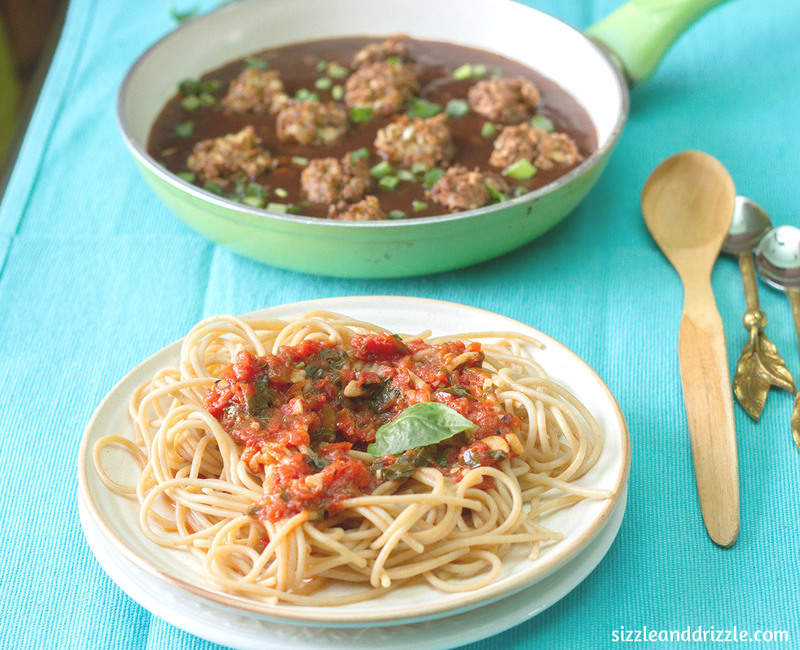 Once fairly thick, take the sauce off the heat and add the fried manchurian balls. Sever hot with some fried rice or noodles. I made some pasta noodles (cooked as per instructions on the packet) and topped it with some herbed red sauce. Recipe here. You can also use beans and your choice of vegetables, but keep the proportion same. Ajinomoto is entirely optional, skip it if you don’t like. But I am sure your Chinese guy uses it. So once in a while it is okay to use. If the manchurian balls are coming apart in the oil, knead it well with a little more water and always cook on low flame so that the vegetables get cooked till the centre. 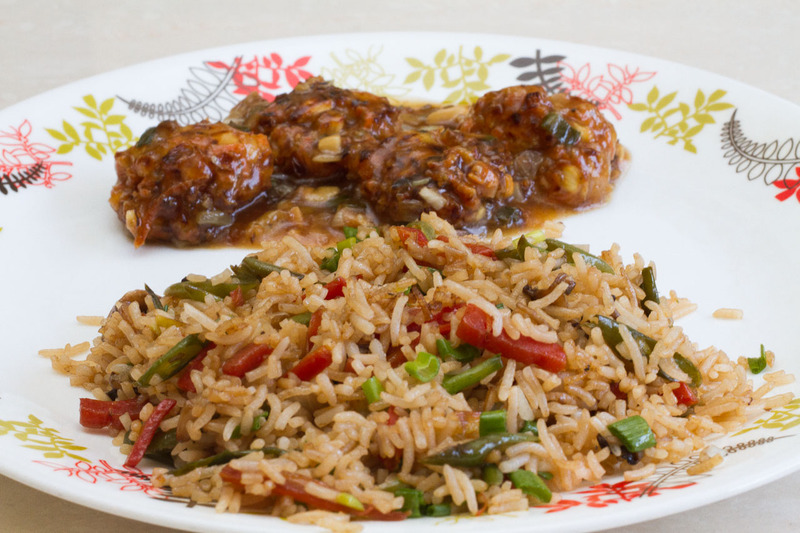 We Indians have been experimenting with the Vegetable Manchurian and the Fried Rice since ages, to get that perfect taste and texture to suit the Indian palette. The inimitable smell of fresh garlic, onions and chillies being sauteed already creates a background for the delectable Manchurian. And of course, the long grained Basmati with a dash of favoured vegetables. Makes for one colorful and dainty main course!